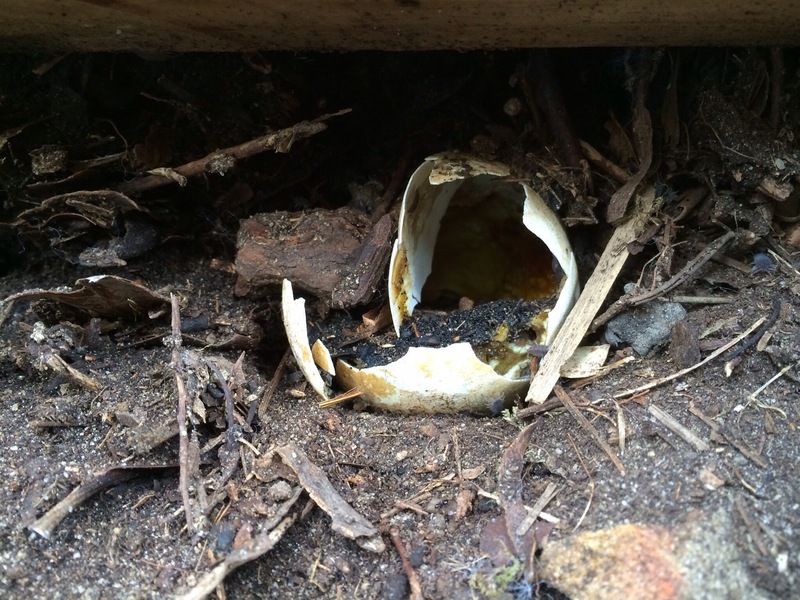 A few of my blog posts have mentioned our unwelcome visitor who snuck in while we were away in the UK (see Back to the nest, Nest status & Chicks away) & proceeded to devastate the garden & create a huge nest mound. 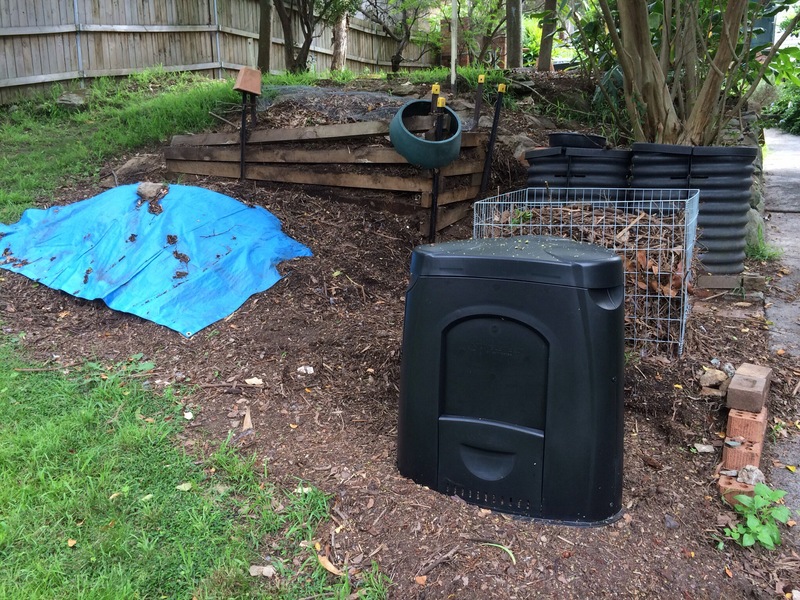 Once the chicks departed & mound activity ceased, we figured that it was time to start reclaiming our compost heap & all the extra material Mr Brush Turkey had gathered. Over time the earth is being separated from the rocks & the tangle of twigs & branches that had been scraped from all corners of the garden (& some of the neighbours?). Not that it’s all done but work continues & evidence of the mound is diminishing. During another session by Mrs Aussie to break down more of the Turkey’s mound created within the original compost heap, a most alarming situation was encountered. Seeing an unusual rounded object within the material, she attempted to uncover it fully. I’m informed that upon the slightest touch, the item exploded! It was indeed, an unhatched Brush Turkey egg & the rotten contents were sprayed out – & accompanied with a vile, nauseous stinking smell. Ears ringing & retreating rapidly to the house, all further work was abandoned for the day! I was to hear this amusing tale when I returned home later (no guesses for who thought it to be the most amusing?). Some Internet research had disclosed that the phenomena was not unknown. It seems that the explosion is likened to the sound of a rifle shot & the overpowering smell is “unforgettable”! While I managed to miss all the fun, I did remember to take these pics of the remodeled compost area & the offending egg remnants. Just when I thought I was on top of the GoPro-to-YouTube thing, now that I’ve got a better idea on whipping up a video via iMovie on the iPad, & while I was still wondering how I’d cope with quite some number of ride video clips – came the offer from Mrs Aussie to turn Producer & process the video from our weekend away on the “Leisure Coast Brompton Meander” (as blogged previously). Before you launch into watching the videos I should caution that our “Team Aussie” undertaking is still a learning experience, but that I (hopefully) expect to do better next time (ie my portion of the project will undoubtedly set you wondering, how one person can get so much wobbly video, have so much slippage of the GoPro mounts, forget so often to start/stop videoing & lose so many opportunities for decent filming – along with miscalculating how long a couple of GoPro batteries will last).